Ringing the bell of the Sine Wave of Life’ at the Philosopher Saint Sri Dnyaneshwara World Peace Prayer Hall & Library is the simplest way to understand the real essence of life. Life with all its varied complexity and multiple factors is not a straight line having a definite beginning and a definite end. The cyclic pattern of life is evident from the repetitions it undergoes. 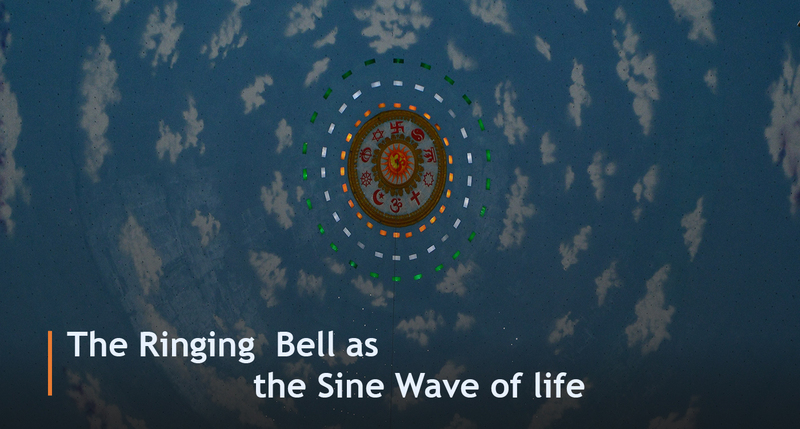 The chiming of the bell coincides with the rising and ebbing of the sine wave that goes all the way to the very top of the dome, and simultaneously another wave starts at the very base of it again. Prof. Vishwanath Karad has very elegantly explained the Co-relation between the Spiritual Element of Life and the Scientific Sine Wave function. Notice how a Sine Wave brings in an artistic element to otherwise drab world of mathematics. Going beyond its mathematical function, the ‘Sine Wave’ serves as an allegory to the cyclicity of life. On the face of it a sine wave does not show cyclicity. It comes across as a wave that crests and troughs at regular intervals determined by the radian at a particular instance of the wave. But the wave repeats itself infinitely since the radians are a repeated quality in itself, but it is so thoroughly embedded within the construct of the sine wave that it is not obvious to an observer. What is obvious, though, is the repetition of the wave just as in ‘Life’.